In small bowl, mix mustard and chiles; set aside. In deep fat fryer or heavy saucepan, heat 3 inches oil to 375°F. In medium bowl, stir cornbread mixes, club soda and egg. Spoon mixture into tall narrow jar or glass. Insert sticks into hot dogs, leaving about 4 inches to hold. 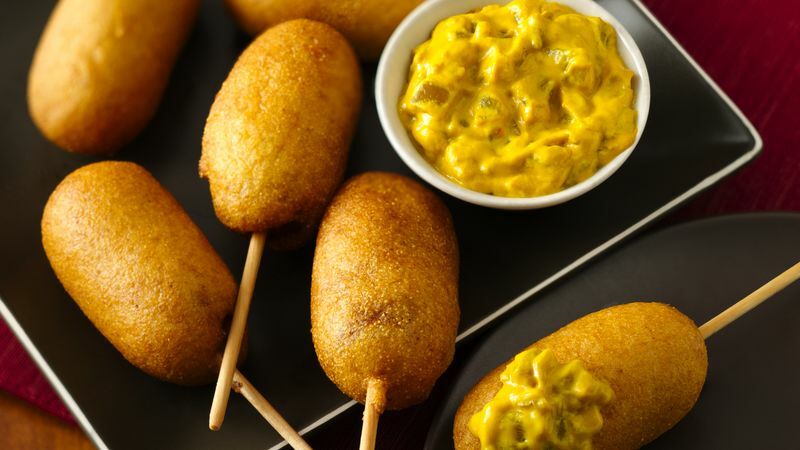 Roll hot dogs in flour; dip hot dogs into cornbread mixture, rolling to cover completely. Smooth batter with knife, if necessary.